Digging and exploration work at the Edge has increasingly taken on the strictures of archaeological investigation as the appreciation of the history of the Edge grows. The need for a new approach has become even more important as two significant mining areas have become Scheduled Ancient Monuments. We have listed below the digs that have so far received more detailed attention than normal. Other digs are also handled with care and if any significant finds are found, they are either recorded at the time or the dig is suspended until a plan of archaeological excavation can be developed, as happened at Pot Shaft in 1995. Pot Shaft at Engine Vein Cleared completely, planned and sectioned throughout and recorded in detail. Stone hammers found in the infill and a layer of wood at the bottom which was dated to the first century AD. The picture shows the coins on the day of their discovery. Scout Hole Excavated with care with finds preserved and recorded. 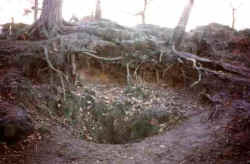 The picture shows Scout Hole before the last phase of excavation when the entrance was open and partly filled with leaves. Saddlebole Mine Partial clearance with finds recorded, sections and plans drawn and a written report prepared. The photograph is of the main entrance which has now been hidden to protect the mine. 1 Resuming a dig on a shaft at Engine Vein which was suspended when the scheduling came into effect. 2 Maintenance and safety works inside Engine Vein. 3 Resuming excavation using Stump Shaft and depositing the residue around the collar of the shaft. The first of these requires an archaeological approach and will lead to a report to the County Archaeologist. A fourth consent has been obtained to permit short-term work to cap a shaft at Engine Vein which started to subside in February 2002 threatening the safety of visitors on the surface. The Club also works closely with the National Trust archaeologists who of course have the final word on any work outside the scheduled areas. Club members are currently working in Tom's Shaft in the Cobalt Mine to clear infill left after the shaft was reopened in 2000. The National Trust undertook work on Stormy Point in 2007 as part of a programme to investigate what is possible to prevent further erosion and protect the archaeology which is rapidly being worn away. Work on past excavations is currently being written up and copies of recent reports can be found HERE. While this work is still incomplete, it will be on the closed Club pages and not available to the general public. The archaeology book from the Landscape Project is however publicly available and details can be found HERE. Cheshire County Council maintains a website with a database of historic sites. Alderley Edge and the mines feature on this site which can be accessed at Revealing Cheshire's Past. Information has been given by the Club to Cheshire County Council which has used it to bring the database up to date. 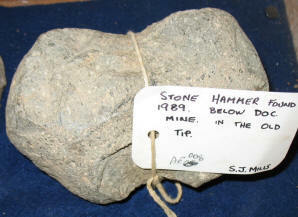 All archaeological remains in the National Trust mines are their property. Any finds at the Edge which are suitable to be moved to the surface are lodged in the museum or in safe storage. Some finds are best left in the mines where they are found. Finds in West Mine which are not National Trust property are treated in the same way. If something is being left in place, it is usually labelled and marked with coloured tape to indicate that it has been recorded and should not be moved. The Club maintains a database of finds but this is available to Club members only. Please do not try to look at the finds database if you do not have a username and password. The National Association of Mining Historical Organisations (NAMHO) publishes some useful guidelines on access to mines and, particularly, archaeology on mining sites. These can be downloaded from their website by going to the main NAMHO site and following links to 'guidelines'..
) from where they will be forwarded to the individuals concerned. The DCC would like to make it clear that it has no connection with the alleged finding of gold bars at Alderley Edge. The Club does not support the removal of such items without proper recording and without the owner's consent. The Club has no connection with the 'Northern Caving Club', Peter Abbadine, Janice Mitchell, Molly_izcool or any others associated with the reported finds. The Club also has no connection with the publishing of a report on the same website concerning the Roman coins find, despite the fact that the report has been lifted, without credits but with certain errors and omissions, directly from a DCC Newsletter. Information published by the alleged finders can be seen on a Yahoo website.